Here you will find ornamentation for you neck. Every necklace I make is unique; some are short, some are long. 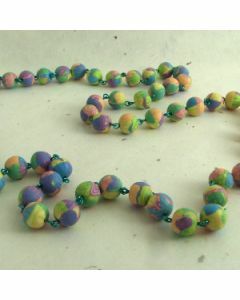 Some are simply a chunky polymer clay pendant on an adjustable satin cord and others have multiple layers of art beads mixed with textile, wire or accent beads. Choker length is approximately 14". It is designed to sit on the neckline and will go with a high-necked top or dress. Princess length is around 18". This length is commonly used for necklaces with pendant as it hangs just below the collarbone. Between 20" and 22", matinee length is long enough to fit around clothing and can be worn in front of collared shirts and blouses or above a plunging neckline. Opera length is around 30" long. It hangs below the bust or can be doubled up as a choker. A lariat (or rope length) is longer than 45".